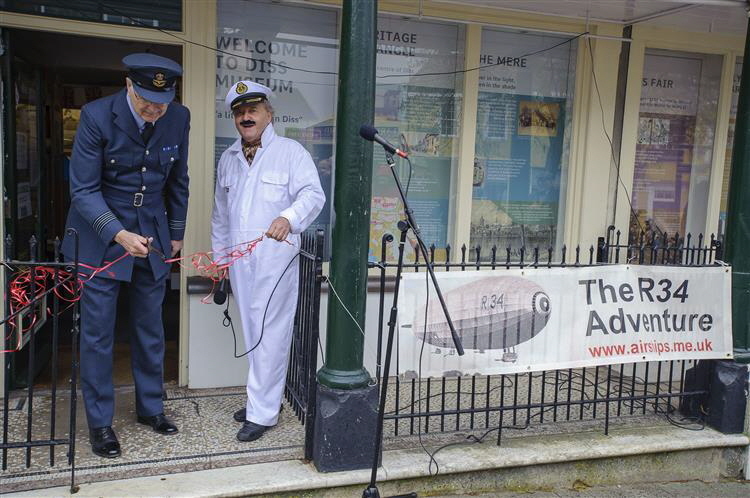 Diss Museum got its 2019 season off to a flying start when manager Basil Abbott donned an airship crew outfit to mark its official opening. A major exhibition celebrating the centenary of the R34 airship’s record breaking flight across the Atlantic is a highlight of the museum’s programme this year. The museum was officially opened by wing commander Richard Youngs who was introduced by Basil in the guise of Air Commodore Edward Maitland, a crew member when in July 1919 the R34 flew from Scotland to Long Island and back to RAF Pulham. The south Norfolk village achieved international fame when the massive 634ft aircraft landed at Pulham Air Station following its epic journey of some 3,130 miles. Museums around the world are joining Diss in celebrating this record-breaking aviation feat – the first double flight across the Atlantic. The special exhibition tells the story and includes airship-themed works by local art and textile groups, a model of the R34 airship made by members of the East Anglian Meccano Set and a special interactive app made by University of Suffolk students allowing people to explore he story of the airship’s voyage. The museum also has 60 new exhibits on show including a First World War needlepoint cushion cover made by Mr W Flatman of Brockdish, a Box Brownie camera, four hand-made wooden jigsaws with illustrations by H St Winslade, school badges from The Entry House School and Aldrich family photographs. The first community cabinet display of the new season is a hand embroidered replica of scenes from the Bayeux Tapestry. The museum also has a selection of donated books on sale as are large number of donated jazz CDEs and box sets. 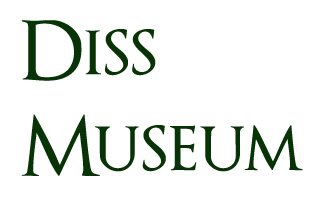 All funds from book and CD sales go to the running and upkeep of the Museum.